After being off the river for a few weeks, because of the rains, it sure felt good to get out. Center Hill Dam was still releasing big numbers of CFS, so we decided to hit the Elk for some nymph and streamer fishing. After discussing rods and canoes with an angler I met at the local fly shop. Mark, Dan and I launched the boat at about 8:15 a.m. The plan was to fish from Tims Ford Dam to Farris Creek with a shore lunch, at the halfway point, to break up a long day in the boat. The trip is nine miles and with a tree across the river at the Van Zant Bend Island we added another 45 minutes to an already long day. Warning- this tree is all the way across the right side of the island. Before launching the boat we were hooked up with several freshly stocked rainbows. There were also carp and gar in the upper section of the river. The Spring and the spill, which appears to have raised the water temp, have brought a variety of species into the river. We started out throwing nymphs and soon were hooked up with our share of browns and rainbows. The 230 CFS release was a good flow and kept us moving at a comfortable pace. The water level was just a few inches higher, but it also opened up several opportunities to fish some spots that are for the most part a bit too shallow to fish. The rains and aggressive spilling over the past few weeks changed the river bottom in several places. The Bend Pool is about the same depth, however the hole appears to be a little further down stream. This change is causing the fish to school closer to the rock wall. Don’t be discouraged there are still fishing feeding on the flat of the upper portion of the Bend Pool. For the most part the river fished very well. We threw everything from #20 midges to #2 streamers. Dan-O-Magic’s and BHPT’s worked well fished about 6” apart and yellow bucktail and marabou worked very well on an aggressive sinking line. We landed a large number of fish and had an extremely good shore lunch of Pork Kabobs, which may make it on the menu for future trips. The trips that were re-scheduled from the May rains are getting back on the books and the calendar is getting back to normal. I just looked and the Army Corps is backing down the release at Center Hill Dam and TVA is spilling 230 CFS at Tims Ford. The next two months should be an excellent time to be on the water in Middle TN. With all the rain and high water, everyone has had time to tie flies and do there chores. I've done some of that as well, but I have also gotten into watching the Deadliest Catch. Then this morning I saw a story on Marshall's site about their involvement in the pebble mine controversy. I have a favorite boat that I like to watch and thought I would stick a poll up (it's over there --->). So, it ain't fishing, well with a fly rod anyway, but until we get back on the water (Tomorrow) I thought I would get a grasp on who watches and which boat is there favorite. So, take a minute and vote. Oh ....and Good Lord willin, we will be on the water tomorrow! We spent the weekend in Townsend. The days were spent at Troutfest, which was a huge success. Byron Begley and all the folks who volunteered to work the event did an outstanding job taking care of everyone. I talked to Byron for a few minutes Sunday and he said he hopes to be involved again next year. Byron, I hope you are involved as well. Thank you for taking good care of us while we were there! The evenings were spent on the screened in porch in a rocking chair listening to the animals and grilling, while talking with friends. Life doesn't get much better than that. Didn't This Start as a Midge? I spent some time tying and talking to some old friends who were in town for the show. There were several manufacturers showing their newest products. One item that stood out was TFO's prototype which is a version of their newest rod for throwing larger flies. The rod goes into production later this year and is a rocket! Some of the biggest names in fly fishing were there. Lefty took time to discuss casting and had some very good ideas to help eveeryone's stroke. At 84 years of age he can cast a rod with the greatest of ease. It is truely amazing. So, with Troutfest behind us it's time to get back on the water. We should be back in the boat before the end of the week and with the water in the lakes receding the fish hopefully will be hungry....we will see. I hope to see you on the river. Alright, we are fast approaching Troutfest, which is shaping up to be one of the biggest fly fishing events in the Southeast. 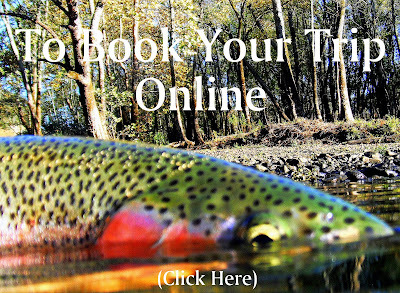 Most of you have seen the agenda of tying and the events that will make Troutfest. Below is the tying schedule and I hope to meet you there and put names with faces. When I am not in the tying tent look for me at the WaterColors by Dan Sharley booth. Stop by and take a few minutes to chat. 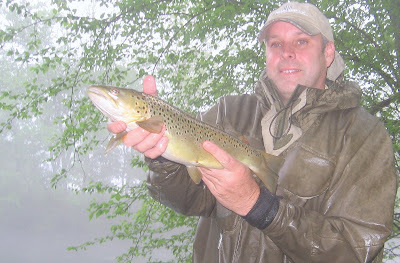 An angler could probably fly fish in a field beside the river at the Caney Fork and the Elk Rivers as both are spilling. But, I do not reccomend it. Norris Dam just began to spill as well, so the Clinch is cranking some CFS too. I can sum up the river report from around Middle TN and some of East TN. Lots and lots of CFS. That didn't take long. 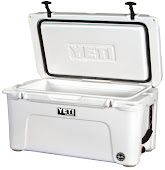 One CFS = 448.8 gallons per minute (I stole that info). Take a minute and look at Center Hill Dam and Tims Ford Dam, then calculate the number of gallons of water coming through the dams. And, if you really have some time to kill....(that's right I know some of you are reading this at work) take a look at Pickwick and Kentucky dams. There is a lot of water flowing downstream. Some folks are planning their Summer Vacations! The latest report from Ron Snow in Montana is.... lots of run-off, but he says that's a good thing for later in the Summer. All this water appears to have a positive affect on the coastal bays in the Panhandle. Reds and Trout have been good even though there is an abundance of muddy water in the area. In the long run the amount of freshwater in North Florida is a good thing for the health of the ecosystem. 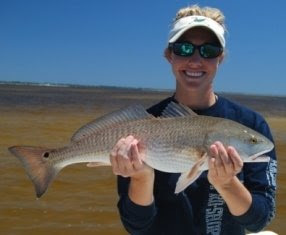 The water temp is starting to hold in the 70s and the Reds are starting to get active in the shallows. The flats in some areas are starting to clear and other parts of the county are going to take some time to clear. I have been happy to see the trout biting good on oyster bars and grassflats, the average size trout has been good and fat this spring. The weather is on a good warm stable trend so the fishing should really get good for the rest of the spring. It's coming up this weekend. Friday night is the banquet, then Saturday and Sunday there will multiple attractions. 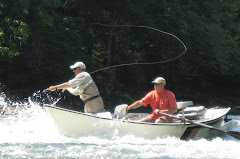 Some of the biggest names in fly fishing will be in Townsend TN. including Lefty Kreh, Joe Humphreys, Walter Babb, Bob Clouser and the list goes on. The schedule of events is posted here and the schedule for the tying tent is posted here. With most of the rivers blown out, this could be an excellent weekend to learn some more about fly fishing from some of the biggest names in fly fishing. I hope to see you there. The Weather Channel Girl talks about the two low pressure areas that are going to collide over Middle TN. The future predictions show the worst weather East of Nashville and over Buffalo Valley. Jim A. is coming down from Johnstown OH as the clouds build and the rains come down. We talked several times by phone throughout the week about the weather predictions and although it is a long drive, sometimes a person just has to get away. Friday afternoon on the drive from M’boro to the river the water is standing in the low lying area. Calls are coming from friends who are headed back home from the river, because of the bad weather and friends who are, like us, going to the river….rain and storms or not, we’re fishing… sometimes a person just has to get away. Late Friday afternoon although, the water is high, the river looks good at the dam, but at the ramp the mud is entering into the water. The creek at the stairs shows mud entering on the right downstream side. The creek at the water meter lets mud into the left downstream side of the river. Fishing the seams of mud Jim produces flashes from fish in between the flashes of lightning. By the time we get to Where Cows Walk on Water the river looks more like Where Cows Walk on Mud. T Caney Fork looks like chocolate milk and the milk colored water covers the entire river… It was a quick float. Early Saturday morning I contemplate heading for the Clinch. 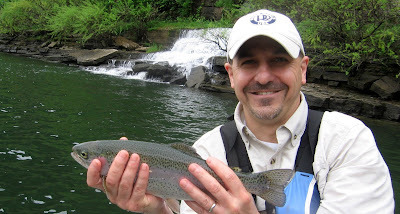 The Clinch River is where I started fishing tailwaters and have wanted to get back over and fish it for the past few years, but just haven’t found the time. We decide to do a little scouting along the Caney Fork River before we set our sights on a plan for the day. As we top the hill on the way to Happy Hollow the river is clear again, or should I say as clear as it can get after three inches of rain in less than 24 hours. We launch and see friends from M’boro, who made it through the night, fishing with hardware and having some luck. With all the boats in the dam-area it was like a washing machine. Everyone was making the circle down the wall, around the bottom of the dam and into the swift water, then downstream. It was a mini conga-line. We fell in line and I watched each boat as they passed the waterfalls at the dam. We only saw one boat pick up a fish or two. When it was our turn we moved into position and Jim put a nice drift on nymph. His reward was a trout just over 12”. Then another trout, and then a bluegill and another bluegill. Then Jim hooked into a pretty good rainbow and brought it to the net. All was going to plan…. ….until, the Army Corps added a siren and an additional generator for even higher water. We called the nice lady at TVA Lake Information Line and found out someone forgot to tell her the Army Corps turned loose another generator. But, someone did tell the stripe that it was a good time to hit streamers and the stripe bite was on for a short time. When you add overflowing creeks to the 7300 CFS it equals highest water I’ve seen on two generators, on the Caney Fork, in a while. But the sun was shining in between rain showers and as we moved downstream we had several follows. One brown that took our bucktail and marabou offering completely out of the water, only to let go before the fish hit the water on its return dive. It was a 9.2 on the judge’s scorecards and would have been a perfect 10 if the fish hadn’t spit the hook. 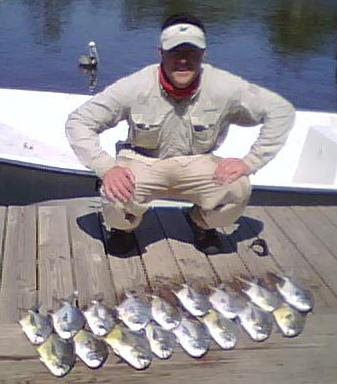 We picked up more fish on our trip downriver including a skipjack. The only species missing was the brook trout. But, we gave new meaning to the Caney Slam with stripe; browns, rainbows, blue gill, and skipjack, all boated before the day was over. We elected to stay off the river Sunday, which was the right thing to do. We decided to just check out some accesses to the lake and the river instead. Now sitting in front of the computer and checking out the TVA Reservoir Information link, Center Hill is rising about a foot every three hours. It looks like an additional generator or possibly a spill might be coming to Buffalo Valley before the week is over.